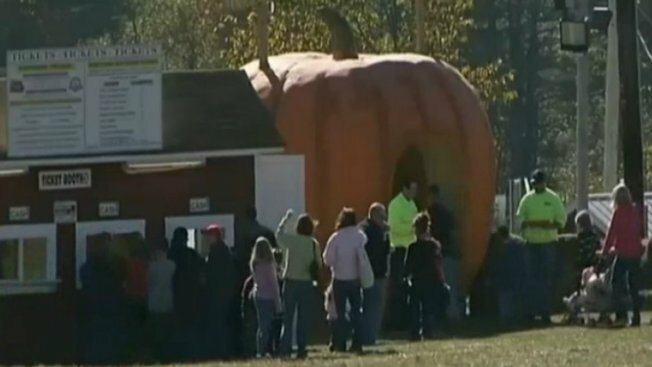 Police have arrested a Hollis, New Hampshire, man following an investigation into an inflatable bounce house accident that left two young boys injured in October of 2014. Police say the bounce house that the kids were playing inside, ages 2 and 3, lifted off the ground, flew over an eight-foot fence and came crashing down 50 feet away. The accident took place at Sullivan Farm in Nashua on October 12, 2014. Co-owner of the farm Gary C. Bergeron, 61, said the bounce house was inflated so it could dry and wasn't open at the time, The Associated Press reported. According to Bergeron, it wasn't scheduled to be open until Halloween. The father of one of the toddlers, however, said a farm volunteer led visitors to believe it was open. Bergeron was arrested and charged with the failure to register the bounce house as required by the Commissioner of Safety. Bergeron has also been charged with the failure to obtain an amusement ride decal and the failure to have the amusement ride properly inspected, both which are required by law. Each infraction is considered a class B misdemeanor. Bergeron posted bail and was released on $1,000 personal recognizance. He will next appear in court on June 24. State Fire Marshal William Degnan wishes to reiterate the importance of making sure all inflatable amusement devices are secured at all times. Thirty-one children have been injured in related accidents since 2008.